Click here to view a video about the 40th Anniversary Reunion of Vietnam POW's. The United States’ National POW/MIA Recognition Day is observed across the nation on the third Friday of September each year. Many Americans take the time to remember those who were prisoners of war (POW) and those who are missing in action (MIA), as well as their families. 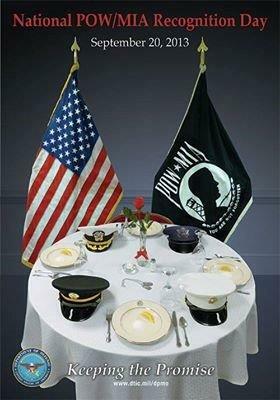 National POW/MIA Recognition Day is not a federal public holiday in the United States but it is a national observance. All military installations fly the POW/MIA flag, which symbolizes the nation’s remembrance of those who were/are imprisoned while serving in conflicts and those who remain missing. Veteran rallies take place in many states on National POW/MIA Recognition Day. United States flags and POW/MIA flags are flown on this day and joint prayers are made for POWs and those missing in action. National POW/MIA Recognition Day posters are also displayed at college or university campuses and public buildings to promote the day. Remembrance ceremonies and other events to observe the day are also held in places such as the Pentagon, war memorials and museums. Click here for more on National POW/MIA Recognition Day. Newt Heisley designed the POW/MIA flag. The flag’s design features a silhouette of a young man, which is based on Mr. Heisley’s son, who was medically discharged from the military. As Mr. Heisley looked at his returning son’s gaunt features, he imagined what life was for those behind barbed wire fences on foreign shores. He then sketched the profile of his son as the new flag's design was created in his mind. Click here for more on the history of the POW/MIA flag (Link courtesy of Neal Schwartz). This website contains much information on POW/MIA issues.